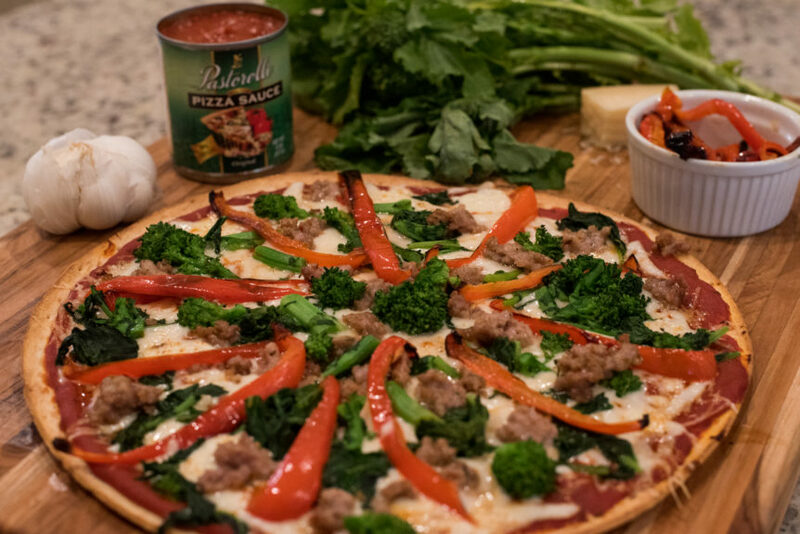 Broccoli Rabe Sausage and Roasted Red Pepper Pizza - Pastorelli Food Products, Inc. Broccoli rabe (also known as rapini) is a bitter green that harmonizes perfectly with sweet sausage and red pepper on a pizza. Blanch the broccoli rabe and roast the red pepper before putting them on the pizza to make them extra tender. The zestiness of Pastorelli’s sauce and the crunchiness of the crust really make this recipe sing. Bring a small saucepan of water to a boil. Meanwhile, fill a large bowl with ice water. Slice the red pepper into strips and toss with olive oil. Spread on a small sheet pan and roast in oven for 10-15 minutes. Blanch the rapini in the boiling water for about a minute till it is bright green. Drain then plunge in the ice water. Drain and squeeze out the water, then roughly chop the rapini and set aside. Heat olive oil in a frying pan on the stove and sauté the ground sausage till there’s no longer any pink. Drain on a plate with a paper town. Assemble the pizza by spreading the Pastorelli pizza sauce on a 12” ultra-thin crust. Cover with mozzarella and parmesan cheese (provolone or Pecorino Romano also work well with this recipe). Top with sausage, rapini, and roasted red pepper then bake for about 10 minutes.